Very easy to grow in the garden, greenhouse or very bright window. Source of the world's most popular spice, vanilla Produces gorgeous sweet pale yellow/green orchid flowers. Picture is for example only. Vanilla planifolia (solid green leaf) The Vanilla Bean Plant This is a native from Mexico to parts of South America and the Caribbean. The flowers are very fragrant and short-lived usually only lasting one day, but are replaced by another the next day. These are a vining, climbing terrestrial that prefers high humidity, bright indirect light and ample water supplies all year. Keep this orchid warm - above 55 degrees and fertilize once a month. They will grow all year if temperatures are kept high, but their main growth period is in the summer. I suggest growing in hanging pots filled with an orchid mix. When the vines reach the ground, drape them back, up and over the pot. This method of growing makes it easy for those that do not have large greenhouses. Our sale plants are 3-5 inches tall and actively growing in 2.5 inch-pot. They grow very fast. 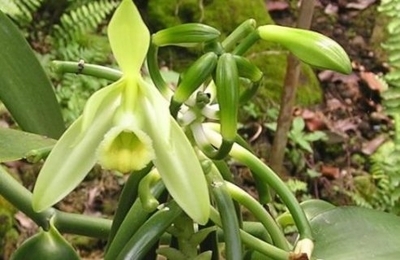 The mature plant will have hundreds of flowers and with hand pollination will produce Vanilla beans.